The National Climatic Data Center released its preliminary analysis of global temperatures for June. The data show that June 2009 was the second warmest on record, and the January-June period was tied with 2004 as the fifth warmest first half of the year. With the notable exception of the Northeast and upper Midwest of the U.S., most inhabited continents were warmer than average. The warmest temperatures relative to average were found in parts of Africa, Australia, and most of Eurasia. The overall June average global surface temperature was +0.62°C (+1.12°F) above the long-term average. The global average sea surface temperature (SST) was the warmest on record for June, 0.59°C (1.06°F) above the 20th century average of 16.4°C (61.5°F). The previously released U.S. June analysis showed the month to be slightly (0.2°F or 0.1°C) above the 20th century mean. This ranks June 2009 as the 49th warmest June since 1895. Regional temperatures were colder than normal in the Northeast and parts of the Southwest and North Central states, but they were above normal in the South, Southeast, and parts of the Northwest. JUNE...OR 75 PERCENT OF THE MONTH. July 16 Update: An under-forecast high of 96° today has helped push the monthly average to 75.2°, well out of the top 10 coolest Julys. 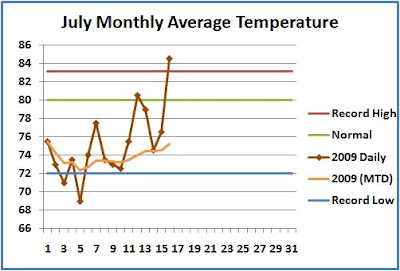 After starting out exceptionally cool, July 2009 remains cooler than average at the middle of the month in Washington, DC. So far, only 1 day has been above average. That was also the only day to have reached 90°, compared to a long-term monthly average of 13.8. As temperatures have moved higher, however, this month's place in the top 10 coolest Julys is becoming increasingly precarious. Only a 0.2° increase in the current average of 74.6° will push 2009 past 2000 into 11th place. Stephen Colbert carries on the war against climate change with a bold proposal: Increase carbon dioxide production to put out the sun's "dangerous, unchecked nuclear power." PHOENIX. THE PREVIOUS RECORD WAS 102 DEGREES SET IN 1985.